Handcar setoff builds on fill as shown or on flat ground. Used by railroads as a place to clear the line or to turn handcars, motorcars, speeders, etc. Common wood pile type trestle found on nearly every railroad in North America. May be built straight or curved. Most parts pre-cut for your convenience. Full scale drawings to be used as templates for fast and easy assembly. Blair Line LLC bridge kits are the only wood trestle kits to include Micro Engineering’s Bridge Flex Trak. Code 70 in N scale. N scale bridge: 5 5/8″ long, 1 1/4″ tall. Designed to fit against a backdrop or as a stand-alone model. A roadside icon, relive the 50’s, 60’s and 70’s with this kit! N screen size: 5.00″ wide x 3.25″ tall. N ticket booth: .50″ x .75″. Min. size for driveway, marquee, ticket booth and screen: 7.25″ wide x 4.75″ deep. Another laser-cut kit and another roadside icon. This kit includes signs for four different roadside businesses. Sure to be an “attention getter” on your layout or module. This is a neat little structure for your railroad yards, stations, backdrop buildings, warehouses and factories of any era. If you have never built a laser cut kit, this is a good one to start with. Assembly does not get any easier than with the Blair Line Loading Dock. We’ve been making this dock for years as part of a couple of our other building kits and are now offering it as a stand-alone structure. Kit includes one laser-cut wood structure featuring precision cut parts for easy assembly and professional looks. This structure is our easiest to build kit. footprint: 3.00″ long x 0.75″ wide. This is the type of garage that used to sit behind nearly every house and was the standard in the United States until the advent of the attached garage. While this type of garage is not built as often today, many survive and will for many years to come. So whether you model steam, early diesel or contemporary railroading this kit will look just right on your layout. The section car toolhouse used to be a trackside feature in every railroad town or city in the United States. A few still survive today so, no matter what you model, steam, early diesel or contemporary railroading this kit will look just right on your layout. You’ll need one of these in each town on your layout. Company houses were found in many coal mining towns, timber camps and other mining towns too. Housing of a standard design was provided to workers by the employers and towns would have several of these housing units. Truck dumps are found in coal mining areas of Appalachia and anywhere coal, stone, or other minerals are delivered by truck to be transported by rail. The “row house” of the South and Appalachia, this style of house was also found in many other parts of the USA. This kit that will also make an excellent company house or down-by-the-tracks type house. Once a fixture in every small town, a few general stores survive in the deepest parts of rural America. 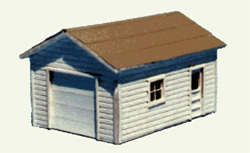 False fronts were nearly a “standard” design for general stores and our kit also includes a store room built on the back as was commonly found on these structures. The once popular cottage type gas station. This kit is based on a real station that stood along US 66 in Carthage, Missouri. Use for the 1920’s-1980’s. Lots of neat details, signs and a billboard with this kit. Kit features laser-cut exterior and interior walls, doors, window frames, floor, roof and sign frames. Also included are pre-printed windows, roof vents, a great selection of authentic full color walls signs taken from prototype restaurants, and a free standing laser-cut sign for roadside. Kit dimensions: 2 1/4″ x 3″. This structure would also make a great guard shack or storage shed for your industries or a chicken house for your farm scene. Kit features laser-cut board and batten walls, door, floor, and sub-roof. 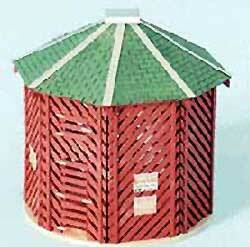 Includes laser-cut peel-n-stick trim and roofing for easy assembly. Also includes a laser-cut scale for the interior. Kit dimensions: 1/2″ x 1″. 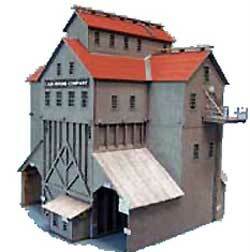 Cash Mine Works is an excellent structure to model with interesting and varied roof lines. Many exposed structural frames. And covered loading areas for 2 tracks or use one for rail and the other for truck loading. Great looks of a craftsman style kit, but laser-cutting makes it easy to build. Over 230 laser-cut pieces including walls with tab and slot connections, doors, trim, floor, roofing and structural frames. Forty two Grandt Line windows. And signs. A common 1950’s-1990’s self service style gas station. Clark Oil operated over 1350 stations in the Midwest and Northeastern United States. Another laser-cut kit and another roadside icon. NEW Cafe structure . Sure to be an “attention getter” on your layout or module. Another laser-cut kit typical of corn drying cribs accross the US. Small board and batten combination depot includes loading ramp. Based on a Missouri Pacific standard design. This design was also used on other railroads. Santa Fe 6-room Section Houses were provided to station agents, section foremen and their families in remote locations where housing was not readily available. Hip roof with flared eaves really sets this depot apart. Medium combination depot includes loading ramp. Based on a Rock Island standard design. Other railroads used designs very similar to this structure. This structure is based on the original Pizzaland building in New Jersey made famous in the opening credits “drive” on the hit show Sopranos on HBO. This kit would be at home in any business district, industrial area or at roadside. Very common business found all over the USA and in all but the smallest towns. Our used car lot is based on lots from the 1950’s but are still common even to this day. Typical backwoods hunting/fishing cabin made of grooved siding with a lean-to addition on one end. Joe doesn’t have indoor plumbing so an outhouse is included. This kit would also make an excellent company house, sharecroppers house, small farm house, hillbilly shanty, or house on the wrong side of the tracks. Classic 1950’s-70’s motel design that could still be in business today. This type of motel could be found on any well traveled highway in big or small towns alike. 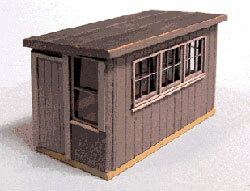 N scale motel office (including canopy) is 2.62″ x 1.80″. 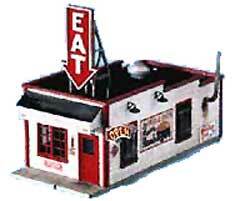 Each N scale motel unit is 3.50″ x1.50″. Based on a 1950’s-80’s style self service gas station. One of the original self service gas stations Hudson’s strategy was to offer self service pumping at a discount over it’s other branded competitors. At it’s peak Hudson Oil operated in over 35 states. Found at roadside in rural areas or along the outskirts of town this type of roadhouse is based on juke joints that would have offered drink, food, dancing and maybe even a few groceries or “recreational” gambling in the back room. Sam’s is located far enough off the beaten path that an outhouse is provided. Build it without the signs and use it for a house. Kit includes laser-cut wood structures that features laser etched vertical planks with nail holes, knots and imperfections in precision fit tab and slot walls. Laser cut floor has a laser etched porch floor with nail holes etched in random length boards. Laser cut door trim, window trim and corner trim feature peel-n-stick adhesive for easier assembly. Windows may be installed open or closed. Kit includes laser-cut wood exterior and interior walls featuring tab-n-slot construction. Laser cut floor with sidewalk. Laser cut door trim, window trim, corner and eave trim feature peel-n-stick adhesive for easier assembly. Laser cut window glazing. Includes interior walls, counters, barstools and interior back wall detailed photo of a typical diner cooking area. Details include laser cut Café signs for each side of the building. Laser cut Yard Café and Hiway Café signs for front of awning and rooftop sign. Detailed laser cut rooftop air condition unit. Also included are burglar bars, wall vents and downspouts. A really nice selection of restaurant and café signs from our extensive photo collection. Laser cut fertilizer supply company (or fertilizer plant as we call them in the Midwest) with trackside unloading capable of receiving dry fertilizer in bulk from railroad hopper cars. Fertilizer is moved from trackside with a series of augers and conveyers to storage bins inside the building. Fertilizer is then mixed to customer specifications and loaded in spreaders with a smaller conveyer which may be installed on the end wall or side wall of our kit. The fertilizer company or farmers using spreader wagons or spreader trucks would then apply the fertilizer to the fields. Some plants also packaged fertilizer mixes in smaller sacks for retail sales to homeowners and gardeners. Kit features laser-cut floor, sub-roof and walls with tab and slot connections. Also includes laser-cut peel-n-stick trim, doors, windows, window glazing and roofing for easy assembly. Laser-cut truck loading conveyer may be installed on the end or side. Bucket elevator with hopper car unloading pan, ladder, handrails and control cabinet included. Also includes signs. Two story lounge, bar, tavern, pub or whatever you call it in your part of the world. Definitely a two-story “down by the tracks” kind of place that would be found in towns and cities of all sizes and all eras. Kit includes laser-cut wood structure that features laser etched nail holes in aged look siding, with precision fit tab and slot walls. Laser cut floor has a laser etched concrete sidewalk, front and back, with etched cracks. Laser cut door trim, window trim and corner trim feature peel-n-stick adhesive for easier assembly. Windows may be installed open or closed. Lounge includes outside non-working lamps, trash barrel, TV antenna, chimney, down spouts, laser cut wall fan and two different sizes of wall vents. Three billboard frames and billboards along with a hanging sign frame and a great selection of signs and wall decals from our extensive collection. Lounge name signs include “Green Door Lounge”, “Dew Drop Inn” and “Calico Cat Lounge”. N scale kit dimensions: 1.10″ x 2.70″ (including sidewalk).